Twelve years ago, Devin Smeltzer was a kid fighting cancer who got to meet one of his baseball heroes. Then they crossed paths again — as players in the LA Dodgers organization. 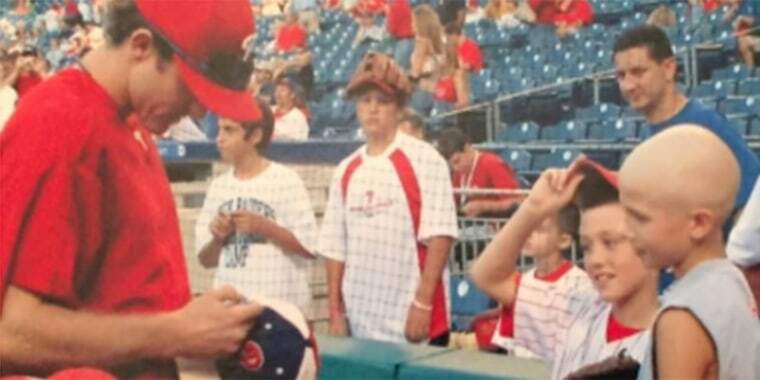 Devin Smeltzer will never forget the emotional boost he received meeting an All-Star from the Philadelphia Phillies in the midst of being treated for cancer as a 10-year-old. Now a pitching prospect in the minor league system for the Los Angeles Dodgers, Smeltzer, 22, was a kid from southern New Jersey living with bladder and prostate rhabdomyosarcoma when he met then-Phillies star Chase Utley on the field at Citizens Bank Park in 2006. "Being able to step on the field at a major league park and meet one of your favorite players was awesome,'' Smeltzer told TODAY. "My only sense of normalcy back then was baseball. I wasn't allowed to go to school or to church, but I was able to play baseball, and it put light at the end of the tunnel." Life came full circle for Smeltzer at the end of spring training earlier this month when he reunited in the Dodgers clubhouse with Utley, who is now a second baseman for Los Angeles. Smeltzer was drafted in the fifth round by the Dodgers in 2016, which also marked 10 years of him being cancer-free. "When you think about the statistics of even making it to pro ball, it's almost impossible what happened,'' Smeltzer said about meeting Utley again. "Me going through cancer, him being on the Phillies at that time and now the Dodgers and us crossing paths, statistically it's almost impossible. It's amazing. "He's one of the most humble guys you'll ever meet. Nothing's changed from when I was 10 until now." Hear about the incredible story of #Dodgers minor leaguer @alka_SMELTZer who survived cancer at the age of 9 and his special connection with a current Dodger. Utley called the unlikely journey that brought him and Smeltzer together again "a pretty special and unique story." "I can't even imagine what he was going through, what his parents were going through," Utley told ESPN. "And to see him beat cancer, to see ... his ability take over and allow him to play baseball for a living." Even though he's not a big-leaguer yet, Smeltzer has made sure to pay it forward since that day he met with Utley. Playing for the Rancho Cucamonga Quakes in California last season, he paid visits to the local hospital to meet with kids. He plans to do the same this year on the Dodgers' Double-A team in Oklahoma, the Tulsa Drillers. "I try getting into the hospital wherever I'm at and just talking to kids with cancer,'' Smeltzer said. "I told the nurses, don't hesitate to give my number out." Smeltzer can empathize with kids enduring similar situations, like the 13-year-old baseball player with cancer he met at a local hospital in Rancho Cucamonga last year. "He's fighting the fight, and I can see how much he's changed since I talked to him because he's a young ballplayer who was frustrated, just like I was,'' he said. "Any interaction, no matter how small, you don't know how it's going to change his or her life. You put a smile on their face." Smeltzer also is dedicating this season to raising money for Katie's Krusaders, a Pennsylvania-based organization that provides personal and financial support to kids with cancer. He raised $11,250 for them last year, and this season he is looking to have people download The Drive app and pledge a certain dollar amount for every strikeout he gets on the mound. "Everybody is here for a purpose, and mine is to inspire younger kids,'' he said. "Baseball has given me this platform, and I want to use it to help others just like they helped me and my family when we really needed it."